Butterfinger Fudge Cookie Bars are peanut butter cookies, topped with a soft chocolate fudge layer and crushed Butterfingers. You’re going to want to make these…trust me! When I was a kid I used to hoard Butterfinger bars. I would trade half of my candy on Halloween to my brothers and stock up on Butterfingers. Growing up, I would ask for a Butterfinger most times in the check out lanes while grocery shopping with my mom. I LOVED Butterfinger candy bars. Then, I moved on to trying everything else in the check out and I no longer chose the same thing. And it wasn’t until years later as an adult that I started buying myself Butterfinger bars again. They are delicious. I have a shelf (or two) in a our pantry that is off limits to the kids. They are not allowed, under any circumstance, to touch any food on this shelf. And it’s such a teasing shelf, piled high with Reeses and Snickers and chocolate chips. And Butterfingers. Last week I was cleaning out my pantry, like seriously taking everything out, checking expiration dates, and REALLY cleaning it. Know what I found? 3 bags of mini Butterfinger bites, 6 King Size Butterfinger Bars and 2 Butterfinger crunch bars. Seriously. Totally forgot they were piled up in the back of the pantry. I have come full circle and found myself hoarding Butterfingers once again. I knew I had to do something about them. Besides eat them out of the package (well, the crunch bars were begging to be eaten). That’s where these Butterfinger Fudge Cookie Bars came into play. 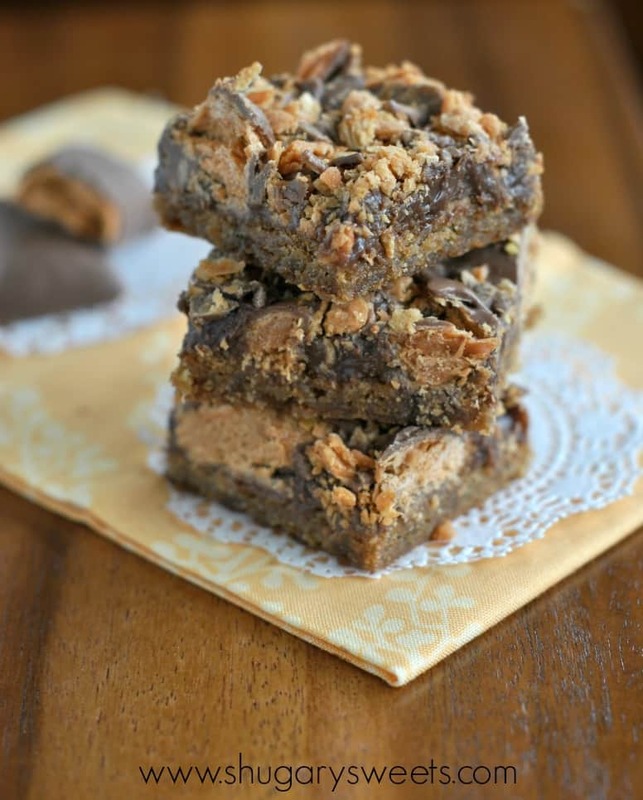 Piled on top of a peanut butter cookie is a layer of decadent chocolate fudge and crushed Butterfingers. Press the cookie dough into your baking sheet. 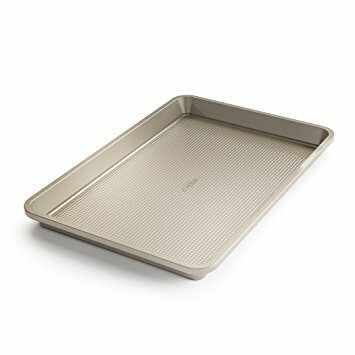 You’ll need a 15x10x1-inch pan. Bake in oven (either following recipe below or package). Remove and continue directions. 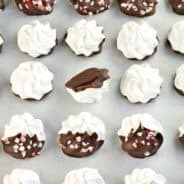 For the fudge layer, combine your sweetened condense milk with chocolate chips and melt it (whether on the stovetop or in the microwave, at 30 second intervals). Pour this over the cookie layer, and spread evenly (not quite to the edges of the pan though). It’s okay of the cookie bars are still warm. Sprinkle with crushed butterfingers. Whether you are using the bites, full size bars, or minis….smash em and sprinkle em. Refrigerate to set it quickly. Slice and enjoy. Some of my favorite cookie bars on this blog involve candy. Whopper Cookie bars are a malted cookie crust topped with fudge and crushed malt balls. Chubby Hubby Cookie Bars have a malted milk crust too topped with fudge, peanut butter and chocolate covered pretzels. Today’s recipe is a twist on those two favorites cookie bars of mine. In my obsession with Butterfingers, I’ve made few desserts over the past few years. 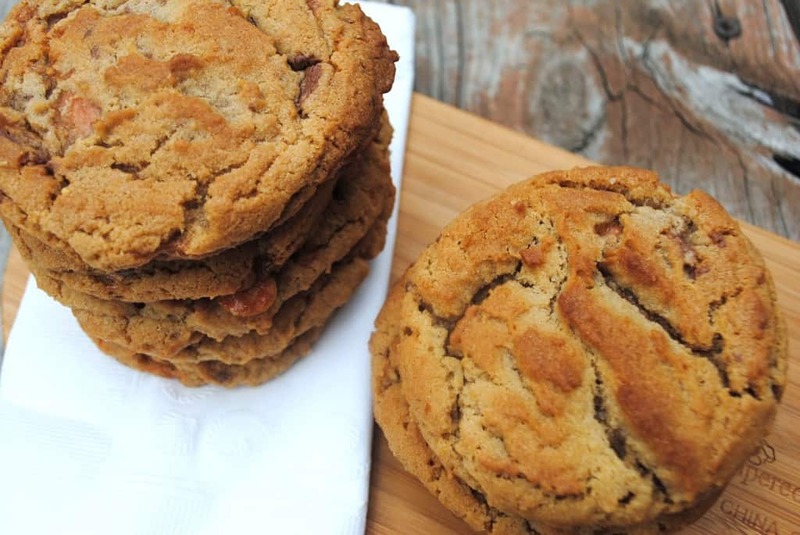 These Peanut Butter Cookies with Butterfingers are chewy and perfect. 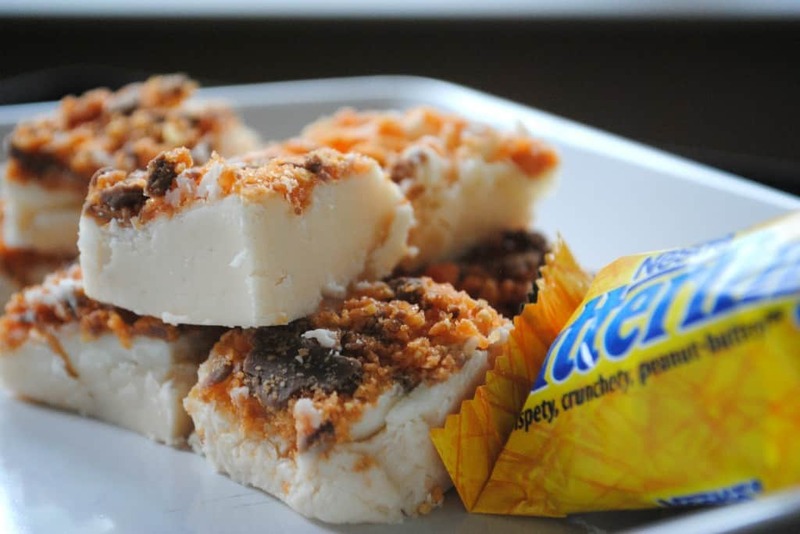 This soft fudge is also topped with crushed Butterfingers. So smooth with a crunchy top! Can’t find Butterfingers? That’s okay. I have a copycat Butterfinger recipe. Just for you! 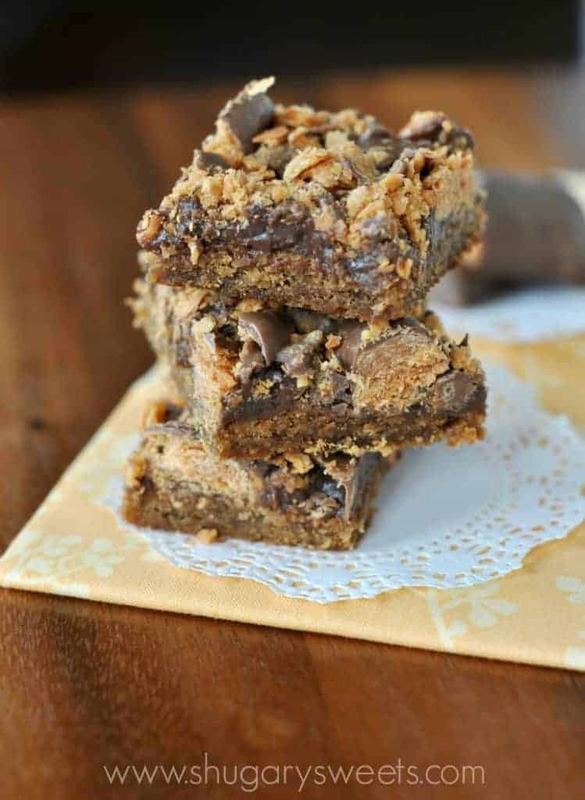 Peanut Butter Cookie Bars topped with a soft chocolate fudge layer and crushed Butterfingers. You're going to want to make these...trust me! For the cookie bars, beat butter and brown sugar in mixing bowl until combined. Add peanut butter. Beat in egg and milk. Beat in the flour, salt and baking soda. 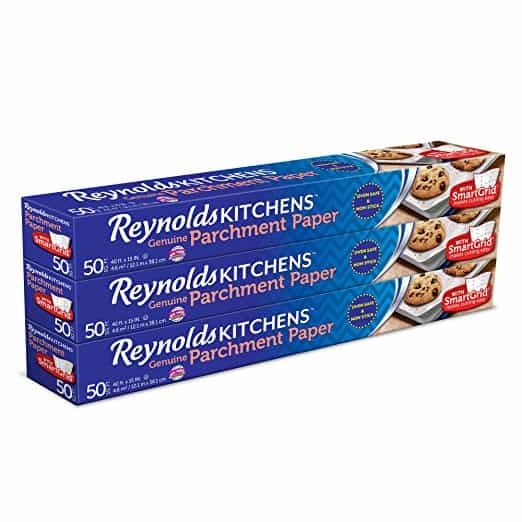 Press dough into a 15x10x1 baking sheet lined with parchment paper. Dough will be sticky, I dipped my fingers in flour before pressing. Bake in a 375 degree oven for 15-18 minutes. Remove from oven. On stovetop in small saucepan, heat sweetened condensed milk until warm. Whisk in the milk chocolate and continue stirring until smooth. Pour fudge over cookie bars. Top with crushed Butterfingers, pressing them into the fudge lightly. Allow to cool completely and cut into small bars. **If desired, substitute refrigerated peanut butter cookie dough for the homemade version. 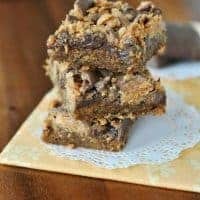 *Today’s recipe for Butterfinger Fudge Cookie Bars was originally published on Shugary Sweets on June 5, 2013 and has been republished in June 2018. Mmm what a fabulous treat! These sound awesome! Thanks Katrina! Have a great day!! It’s a special talent to buy candy and lose it!! Wow you love your BFs! I love seeing the backlinks! And these new bars – with BFs, PB, chocolate, all kinds of texture, they’re right up my alley! I love BFs too! Hahaha! I love it! Well…this is an obsession we share, Aimee. I, too, pined for Reese’s (my biggest weakness) and Butterfingers growing up. Clark Bars were acceptable if Butterfingers were nowhere in sight. And, oh girl! I have baked peanut butter cookies with chopped Butterfinger candy bars in the dough as well! Thanks for sharing! Glad others are as obsessed with Butterfingers as I am! LOL Elaine. As you share a skinny recipe today. Hmmm, balance?? I think I’ve gone to Butterfinger heaven! Can’t wait to try these! These look like pure heaven!! Butterfingers and peanut butter are my favorite! just pinned! LOL, I need to do that with my pantry. I think that will go on my summer bucket list. I’m kind of afraid of what I’ll find! I have the same problem of stocking my cupboards with bags of candy and then forgetting about it. There was a bag of butterfingers in mine a few weeks ago that I had forgotten about…it became cookies pretty quickly! I wish I had this recipe then, because girl, this looks awesome!!! Love that fudge candy layer!!! I’ll take one of everything please! Those butterfinger fudge cookie bars are going to be made in this house very soon! I always look in the candy aisle for inspiration, but I know it would be dangerous to actually buy anything! These look amazing- I love butterfingers! I loooooove butterfingers!!! Total drool city over here looking at these! These are amazing! 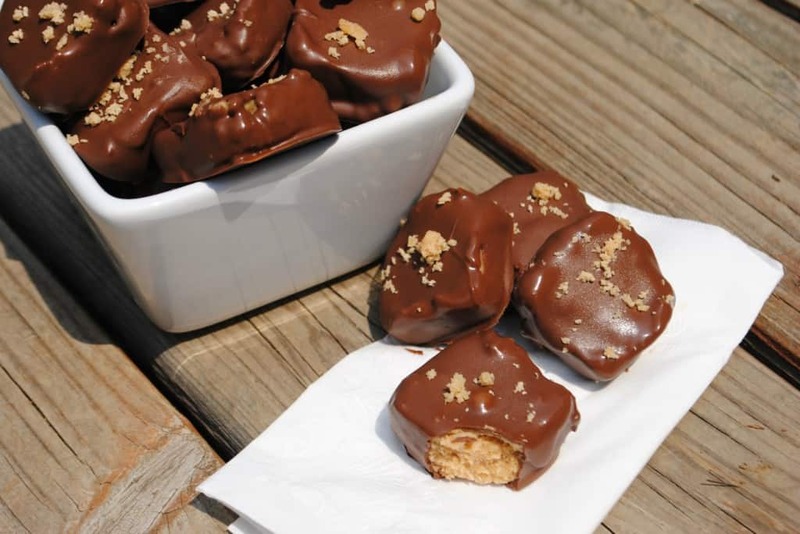 Wish I had some Butterfingers in my cupboard so that I could make these today! These sound amazing! I noticed you mentioned Rollos at the end of your blog and had to reply. I am sure you have a good idea as what to do with them, but I just wanted to share my thought as to how to use them. I like to cheat and use the cookie mixes from a bag, not cool I know. I also like to make them in mini muffin tins. So after your cookie bakes just take a rollo and shove it down in the middle of the cookie! Most excellent surprise when you bite into the cookie! Hope you try it and enjoy! Wow! Now this is definitely a “sugary sweet” haha. What an awesome looking cookie bar! They would be devoured in this house, for sure. I love candy bars but never eat them nearly as much as I would like! This sounds great and I seriously need to try one of your cookie candy bars! I’m a gigantic Butterfinger lover, just as you describe yourself. I’ve seen the mini ones and I’m so afraid to buy them because they’ll be calling my name if I don’t use them immediately. These bars are the perfect vehicle for them. I gotta do this soon! Butterfingers are my favorite candy bar. These cookie bars look amazing! These sounds SO delicious! Butterfingers are one of my absolutely favorite candy bars :). Are you and my husband related? 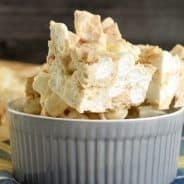 He stockpiles Butterfinger bars too and they seem to hide out in the pantry in random places… He need to find his stash so I can make him these! Oh my gosh! The pictures have me drooling! What a beautiful bar! I can only imagine how wonderful it must taste! These are some beautiful cookie bars! Mmm. These look fabulous! I think I would eat the whole pan! Aimee, Gosh these look divine! I always wanted Butterfingers most of all, in my Halloween candy! My kids will love these! Bar cookies are one of my favorite things to bake and share, too. LOVE your blog! Fantastic pictures! Oh my gosh. These sound absolutely amazing! 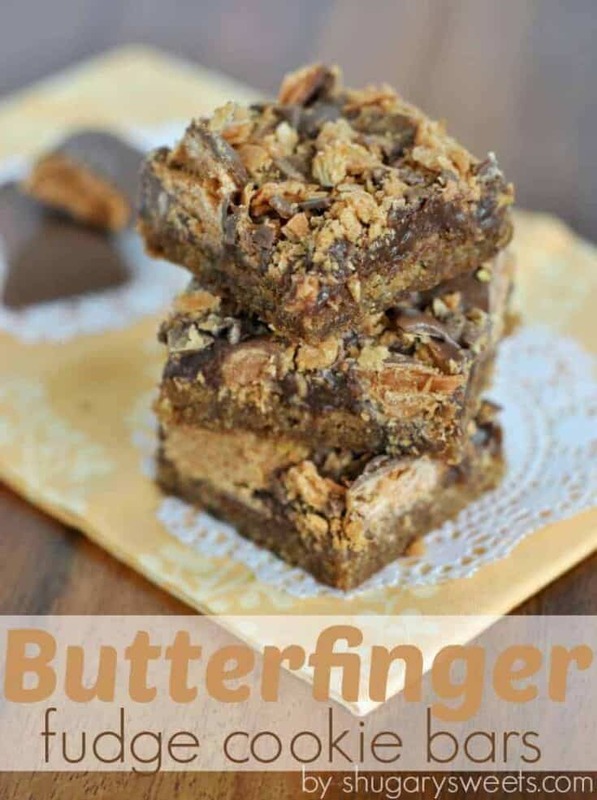 All of your Butterfinger recipes sound so good – i actually never realized how deep my love of Butterfingers was until one Halloween I bought a bag to give out and ended up eating them all beforehand. Love. Butterfingers. It’s pretty much a guarantee that if it has butterfingers, I”m going to love it! These look amazing Aimee. Have fun this weekend at BHF! Wish I could’ve made it. Butterfingers used to be my favorite as a kid, but I haven’t had them in years. The whole thing at once just gets too stuck in my teeth and they’re so sweet. But broken up and used as a topping sounds perfect! As a kid, I ate Butterfingers like nobody’s business. Butterfinger blizzard? I’m all over that! I get the urge to have one every now and then and I remember how much they stick in my teeth. Then I’m good for about six months. These bars? I need them. I am making these today for a special man 🙂 I know he is gonna love em! You are going to kill me, Aimee! LOL! Every recipe you post, I say “I MUST try this one”. I haven’t searched your site; but have you made cake pops? I made them with the Oreo truffle recipe (ground up Oreos, a little sugar and block of cream cheese). Rolled into balls then dipped in white chocolate with colored jimmies on top. They were fantastic. Haha!!! glad you enjoyed them, and glad your friend sent you the link! 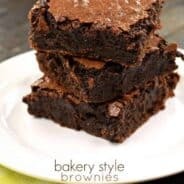 Thanks for stopping by my page, ENJOY the recipes! Just wanted to let you know that I made these bars while my son and I were visiting my nieces (in Florida) this summer. They were a TOTAL hit with everyone! Now, tomorrow is the first day of school for my 8th grader (her in GA) and I’m making them right now for him to have in his lunch box for the first day of school-he can’t wait for lunch tomorrow!! Thanks for the great recipe!! Aww your comment made my night! So glad to hear you enjoyed the cookie bars. Now I’m wishing I had some in front of me! For a substitute for peanut butter bedside other nut butters? Wow, these were really good! I even added some butterscotch chips to the cookie layer. Really delicious! Not in my house, haha! If you keep in a covered container at room temperature, about a week. The butterfinger lose their crispiness, but the flavor is still delicious! 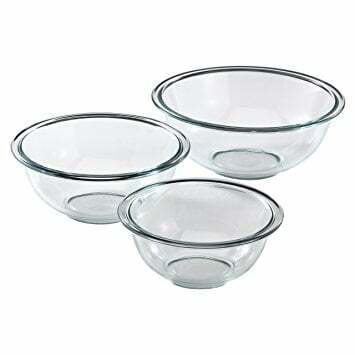 Do these need to be kept refrigerated or at room temp? Either way works fine. If your house runs warm, then pop them in the fridge!